When applications that are deployed in Kubernetes need to be accessed from outside the cluster, an Ingress needs to be created. In Kubernetes, Services can also be exposed via a Load Balancer. There are several options available to make your application accessible and the right choice may depend on your requirements. In this webinar, we will discuss how Ingress and Load Balancing works in Kubernetes. We will also show a demo of how Citrix ADC serves as an Ingress device on a Nirmata managed Kubernetes distribution. All major cloud providers have embraced Kubernetes. Using a cloud provider managed Kubernetes services is an easy way to get started with Kubernetes, as the cluster’s control plane installation and management are taken care of by the provider. There are several similarities in these offerings, but there also are some interesting differences. In this webinar, we will compare the managed Kubernetes services from the top 3 cloud providers, discuss when to use managed Kubernetes services, and what else is necessary for enterprise-wide Kubernetes use cases. Enterprises are looking to automate end-to-end delivery of their applications. Creating continuous delivery pipelines, not only allows enterprise software teams to move faster but also enables them to respond quickly to any failures. In this episode of Keeping Up With Kubernetes, GM Financial Emerging Data Technology Lead Jeff Loyd speaks with JoAnne McDougald about how the evolution of managing complex development workloads has led us to containerization, and how containerization and VMs have completely changed the game. In this episode of Keeping up with Kubernetes, Twistlock CTO John Morello speaks with Joanne McDougald and Nirmata’s Ritesh Patel about the state of security for Kubernetes as well as the close integration Niramata and Twistlock have developed to bring container security to Nirmata’s powerful cross-provider container management platform. In this episode of Keeping Up With Kubernetes, Portworx VP of Engineering Venkat Ramakrishnan speaks with JoAnne McDougald and Nirmata’s Jim Bugwadia about where containerization is in 2019, what it takes for enterprises to adopt containers for their development process, how Kubernetes is clearly becoming the dominant route in that adoption process, and how Nirmata and Portworx together offer enterprises a straightforward path to Kubernetes. In this episode of Keeping Up With Kubernetes, Diamanti Director of Product Marketing Sean Roth speaks with JoAnne McDougald and Nirmata’s Anubhav Sharma about why KubCon has grown so drastically year over year, and what we can expect from containerization in 2019, as well as how Diamanti and Nirmata have partnered to offer a complete solution for enterprises to adopt Kubernetes. In this episode of Keeping Up With Kubernetes, Spotinst Founder and CEO Amiram Shachar speaks with JoAnne McDougald and Nirmata’s Ritesh Patel about how Spotinst has partnered with Nirmata to bring the dynamic infrastructure qualities offered by the Spot instance market to Kubernetes. Nirmata Co-Fonder and VP of Products, Ritesh Patel meets with #TalkKubernetes at KubeCon 2018. Ritesh reveals an overview of how the Nirmata platform transforms application management for the enterprise. workloads with Vault for enterprise grade secrets management. 1. Learn best practices for managing secrets in Kubernetes. 2. Get an overview of HashiCorp Vault and learn how to use the tool for managing secrets i.e. sensitive data like passwords and access keys. 3. Discover Nirmata integrations with Vault. Developing a cloud-native operation is fraught with challenges, from the technical and operational to those involving process and skill set. The adoption of containers is a key to overcoming this suite of challenges. Nirmata offers a turnkey solution that accelerates this adoption. Nirmata Co-founder Ritesh Patel describes exactly how Nirmata does it. The journey to the cloud doesn't end with cloud adoption— in fact for many firms, it’s a story of more cloud, more complexity, more problems. Jim Bugwadia co-founded Nirmata to solve the problems of managing complex applications in the cloud through containers (the best way to manage enterprise applications) and Kubernetes (the best way to deploy and operate those applications in the cloud). Virtualization has totally changed how IT teams and developers get access to infrastructure. Industry veteran Wayne Greene explains exactly what’s changed, the challenges the new paradigm poses, and why containers present the most compelling solution. With Nirmata’s SaaS offering for container management, you can focus on innovation and less on the nuances of infrastructure. Anubhav Sharma, Nirmata’s head of business development and sales, discusses how Nirmata is uniquely able to translate the technical capabilities of Kubernetes into real-world business and organizational outcomes for customers. From IT Operations to DevOps, Nirmata can bring the power of Kubernetes to the entire enterprise—and its customers. Nirmata VP of Engineering Damien Toledo explains how Nirmata’s roots in managing complex telco networks give the firm a unique ability to address the similar challenges of managing complex cloud environments. Damien also highlights why cloud-native applications offer so much value to the development process. Anubhav Sharma runs sales, business development, and alliances at Nirmata. 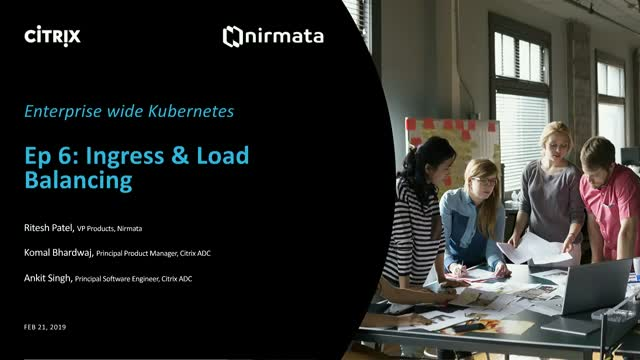 In this episode, Anu discusses how Nirmata allows customers to manage complex containerized environments easily, and how that easy and effective management benefits the entire organization. By 2013, cloud-native applications were beginning to tax traditional application development architectures. In this episode, Nirmata founder Ritesh Patel discusses Nirmata’s origins and how the company’s solution evolved to address these application development challenges with Kubernetes. The open source ecosystem has produced some incredible technologies that have also been crafted into enterprise-ready tools. In this episode, Nirmata CEO Jim Bugwadia discusses how Kubernetes fits into that open source ecosystem, and what Nirmata’s individual approach is to delivering Kubernetes as a powerful, enterprise-ready tool for container management. Ready to learn how to manage persistent storage for containers in the multi-cloud environment? Kubernetes is enabling multi-cloud strategies for the Enterprise like never before. As data is a fundamental element of all Enterprise applications, without a consistent data management strategy, companies have been able to containerize 5-10% of applications, mostly stateless workloads. With Kubernetes adoption, Enterprises have to think about data management strategies because, without it, companies cannot truly adopt multi-cloud. Data backup, data portability, and DR are critical requirements that have to be addressed as part of any robust Kubernetes solution stack. In this webinar, will be talking about best practices on managing persistent storage in a multi-cloud environment and demonstrate application portability across the clouds leveraging Nirmata and Portworx. Kubernetes has become the multi-cloud OS for enterprises. In this series, we will look at what makes up an enterprise-grade Kubernetes stack, and the key tradeoffs for each component. 1. What are the top 5 things I need to do to secure my cluster? 2. What do I need to consider for securing applications deployed in the Kubernetes cluster? 3. How do you recommend customers evaluate and compare the security solutions in the CNCF ecosystem? Nirmata is a Kubernetes operations & management platform, designed for enterprises. Nirmata provides comprehensive policy-based automation for deploying, operating, and optimizing containerized applications across clouds, via easy-to-use, intuitive interfaces. Nirmata empowers enterprise DevOps teams by fully automating the complex operations and management of application containers. Nirmata is a Kubernetes certified solution, and Nirmata, Inc. is also a Kubernetes Certified Solution Provider.